SETH’S PICK :: NEXUS OMNIBUS VOL. 1: There are lots of new books that look interesting to me this week. There’s horror in the Baltimore: The Play one shot, super heroics in Hawkeye #4, and pulpy adventure goodness in Rocketeer: Cargo of Doom #4. Still, when I saw Dark Horse’s first volume of Nexus omnibi on the list, I had to pick it. If you’re among those who haven’t experienced this classic take on superheroes and space archetypes from Mike Baron and Steve Rude, now is your chance to read the earliest adventures in an affordable format. It’s fourteen classic comics for $25, and it’s a volume that deserves to be in any comic fan’s library. 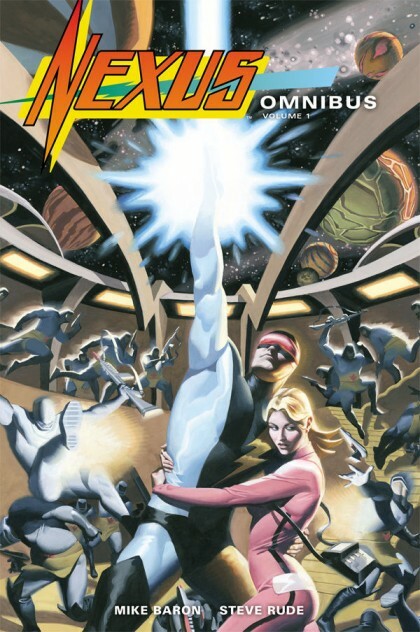 Besides that, it’s comprised of over 400 pages of Steve Rude art, and that alone is worth every cent.